If you download Flash Hero from Asasa Sofware expecting another Guitar Hero clone, you’re going to be sorely disappointed. Unfortunately, if you download Flash Hero expecting a robust photo editing tool, you’re still going to be disappointed. 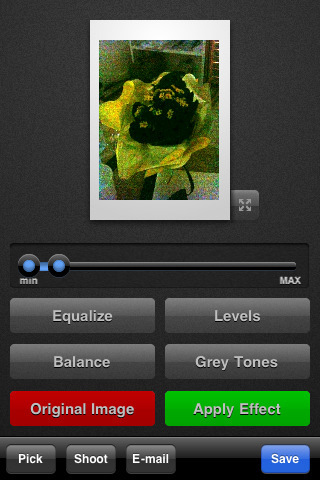 A cheap, basic photography app, Flash Hero gives you a few simple tools for tweaking your iPhone photos. You can apply various exposure effects to improve less than perfect photos, but the app leaves a lot to be desired. Photoshop this is not. One of the biggest complaints made about the iPhone camera is its lack of flash. Pictures taken in dim light generally come out grainy and off-color, if not totally shadowed, and there’s not a whole lot you can do about it. Flash Hero tries to fix this by giving you sliders to quickly adjust color levels and balance. In theory, you’d be able to salvage so-so photos with a few easy swipes, and while Flash Hero’s interface is beautifully clean and intuitive, getting a useful result is too difficult for the casual photographer. While the sliders are easy to use, it is almost impossible to see what you are doing in the tiny photo editing window. You can shift to a larger view, but you lose the ability to make adjustments, and I found shifting back and forth between the two views tedious and distracting. Knowing which effects to apply isn’t always clear, and because you can only adjust one slider at a time, it takes a fair bit of fussing before you get it just right. Of the three filters, I could only really get useful results out of one, and the others almost invariably left my photos worse. The default settings would generally wash them out or cast weird blue or green tones over everything. I liked the bonus feature to turn color photos to gray scale, but it was a very minor plus. Overall, it’s a great concept with a very sleek interface, but even at 99 cents, the results just don’t deliver enough to make it worthwhile. AppSafari review of Flash Hero was written by Tracy Yonemoto on March 25th, 2010 and categorized under App Store, Photos, Utilities. Page viewed 3367 times, 1 so far today. Need help on using these apps? Please read the Help Page.